Figure 1. Thick asbestos-like scale wrapped around tufts of scalp hair. Figure 2. Scalp biopsy showing a papillomatous surface with quills of keratin adherent to hair shafts at the surface. Over a six-month period, a 23-year-old woman noted on the crown of her scalp the development of adherent scale that bound tufts of hair in an asbestos-like sheath (Figure 1). Hairs may be associated with a variety of casts, including those due to the following conditions. Peripilar casts are characterised by irregular sized, white cylinders that can slip up and down the hair shaft. They are due to retention of the inner root sheath of the follicle. The inner root sheath acts as a type of plaster cast that moulds the soft keratin as it emerges from the hair bulb to form the hair shaft. Normally the inner root sheath disintegrates at the level of the sebaceous duct, but with peripilar casts this fails to occur. Pediculosis may present as multiple white concretions on the hair shaft that do not wrap multiple hairs. The concretions are eggs of the lice responsible for pediculosis. White piedra also presents as white concretions on the hair shaft. These are due to aggregated colonies of fungi representing a variety of trichosporon species. Pityriasis amiantacea is the correct diagnosis. 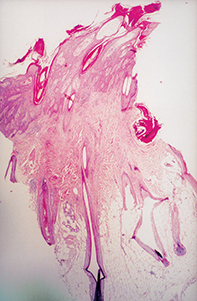 A scalp biopsy showed a papillomatous surface with hyperkeratinisation that wrapped around hair shafts (Figure 2). The underlying dermis showed superficial lymphocytic inflammation. Stains for fungi were negative. Pityriasis amiantacea may occur in the setting of chronic dermatitis, psoriasis, pyogenic infection or fungal infection of the scalp. The thick scales are very adherent and may prove difficult to remove by simple shampooing. Skin biopsy illustrates that the problem is related to abnormal keratinisation of the follicular orifices surrounding the multiple hair shafts. Treatment may need to be directed to the underlying dermatitis, psoriasis or fungal infection. Topical tars (such as 6% LPC), 2% salicylic acid in sorbolene, tar shampoos or topical corticosteroids may be useful. Tinea capitis needs to be verified by fungal cultures; oral antifungals, including griseofulvin, terbinafine and itraconazole are all effective treatments. The asbestos-like scale may require keratolytics such as 25% urea and 3% salicylic acid in sorbolene that can be compounded and left in the hair overnight before being shampooed out in the morning. Asbestos-like scale encasing multiple hair shafts is recognised as pityriasis amiantacea and may be an indication of a number of scalp dermatoses. This article was first published in Medicine Today in June 2003. It was reviewed and updated in November 2012.